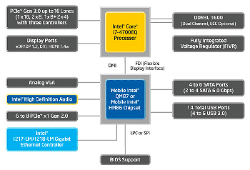 [Updated Jan 21] — ADL Embedded Solutions announced one of the first 3.5-inch form factor SBCs to use Intel’s quad- and dual-core 4th Generation Core (“Haswell”) processors. ADL Embedded Systems (ADLES) says it designed the ADLQM87HD single-board computer (SBC) for use in space-constrained mobile and embedded systems that require high performance, low power consumption, and wide operating temperature. Targeted applications include radar and sonar processing, image processing, tactical command and control, surveillance and reconnaissance, medical imaging, and industrial automation, although the board’s capabilities are suitable for a much wider range of uses. We saw Intel’s Haswell processors show up in a handful of Mini-ITX boards, in quite a few COM Express modules, and even in a PC/104 CPU module during the latter half of 2013. But at this point, the only other 3.5-inch Haswell-based SBC we’re aware of is Avalue’s ECM-QM87. In contrast, most 3.5-inch SBCs during 2013 used Intel Atom Bay Trail-I SoCs, AMD G-Series SoCs, or Freescale i.MX6 ARM SoCs. 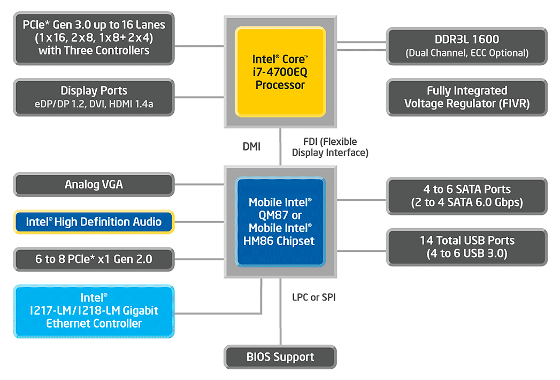 The ADLES ADLQM87HD board implements Intel’s “Lynx Point” architecture, which combines the Haswell processors along with the QM87 mobile platform controller hub. The board comes with a choice of three dual- and quad-core 4th Generation Intel Core i3/i5/i7 processors, having 37 or 47 Watts TDPs (see specs list below). Four video output alternatives — DVI, VGA, HDMI, and DisplayPort — are supported by an Intel HD Graphics 4600 controller, which also offers compatibility with the DirectX11.1, OpenGL 4.0, and OpenCL 1.2 graphics standards. Other key features of the SBC include four RAID-enabled high speed SATA interfaces, 11 USB ports (of which three support USB 3.0), two Gigabit Ethernet ports, three serial ports, HDA 7.1-compatible audio, and a TPM 1.2-compliant security module. A miniPCI socket offers on-board expansion, and a pair of 40-pin headers configurable for either four PCIe x1 lanes or one PCIe x4 lane support a mezzanine-style plug-in module. The latter is based on a pair of 40-pin Samtec connectors on the back side of the board. With regard to the board’s dual-40-pin PCIe expansion bus, we wondered if it was based on a pre-existing standard, such as PCIe/104, and whether there are mounting holes for a standardized line of PCIe-based mezzanine modules. In an email, JC Ramirez, ADLES U.S. engineering and product manager explained that the board’s PCIe expansion bus uses a unique pinout that is not derived from any pre-existing standard, and is not accompanied by mounting holes for a standardized mezzanine form-factor. However, Ramizerez said the board’s 2×40-pin PCIe bus is “standard on our GS45, QM67, QM87, and all future boards that support PCIe,” and added that a couple of custom modules have been developed for key customers and will be released as standard products in the coming year. The latter include a PCIe slot backplane board with various options including a mini-PCIe socket, and a quad Gigabit Ethernet module. The ADLQM87HD SBC is available rated for either -20 to 70°C (“standard”) or -40 to +85°C (“extended”) operating temperature ranges, and is supported with several thermal management options. An ADLMES-8200 “rugged modular enclosure” is also offered. ADL Embedded Systems will showcase the 3.5-inch ADLQM87HD SBC in its booth at Embedded World in Nuremberg, Germany next month. Additional details at the company’s ADLQM87HD product page. Hmnmmm…. I really like this… dual lan ports? GREAT! Right off the bat I thought this will make a great, small pfSense firewall!